On October 19th, my goal is to participate and complete the 42.2 kilometer course of the Toronto Waterfront Marathon. As difficult as this event might possible be, (my first full marathon), it will be absolutely nothing in comparison to one of the most challenging and gruelling endurance events on the face of the planet. In this particular event, there are no bib #’s or chip times. There are no water, Gatorade, gel or 1st aid stations found anywhere along the course. Participants have to locate their own water and energy sources along the route, and if they are injured, well, they are completely on their own. Finding appropriate shelter is the responsibility of the participants, and you will not find any participants wearing backpacks with extra gear or clothing. They are facing the elements with only the “skin” God has provided them. It is a 4,000 plus kilometer “race” against time, and from dying from hypothermia, as the participants travel from Ontario, and other parts of eastern Canada to the forests of the Sierra Madras mountains of Mexico. Yet for an individual that can travel at BEST a foot a minute, how can they ever complete a 4,000 plus kilometer journey within 2 months. At that rate it would have to take at least a thousand human lifetimes to complete. During my 3 day and 2 night family vacation adventure getaway, I got to “hang out” with one of the participants, and just observed as it prepared for his or her upcoming endurance event. It all happened when my wife and I were driving to my cousins property for our little getaway. While driving, I just happened to feel movement on my arm. It was a caterpillar, but just not any caterpillar, but a caterpillar of the Monarch butterfly. The only explanation I could think of how it got there is that I must have brushed up against a patch of milkweed we specifically grow in front of our house as host plants for this amazing insect. 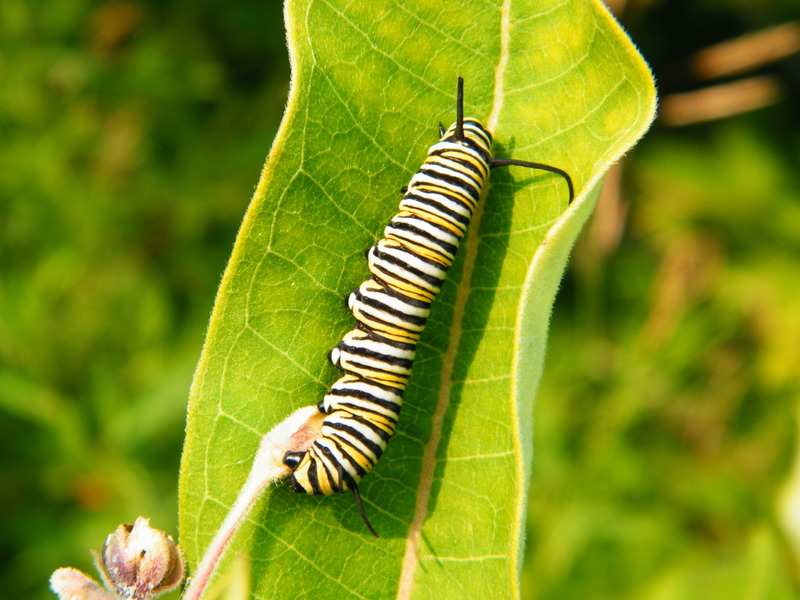 The milkweed is the ONLY food source of the caterpillar of the Monarch butterfly. I handed my new friend to Lynne, who in turn put it in an empty water bottle, that had a couple of drops of water remaining, and we continued driving. My first priority upon arrival was not to unpack, not to set up camp, but to find some milkweed. I was fortunate to find some only about 100 metres from where we eventually set up camp. For about 3 hours, from when I attached the caterpillar to the milkweed until nightfall my new friend did nothing. It just sat or lay there motionless, not moving a millimetre. I was concerned, and was asking, “Are you okay? Do you not like your new home?” But of course, it is a caterpillar, and to the best of my knowledge, they just do not understand human dialogue. At the first break of day the next morning I went running back to the milkweed patch, found the milkweed and individual plant, and discovered with joy and elation his new friend was eating. While checking back at noon, it was still eating, and later that evening…you guessed it….still eating. And it continued to eat the entire rest of the time I was there. I was SOOO HAPPY. It was like a 24/7 “all you can eat” buffet. It ate upside down, it ate right side up. When it was done 2/3rd’s of one leaf, it moved to another and started eating it. Then it moved back to the original leaf, and ate it until it was completely gone, and then moved to an entirely different leaf again to start eating. Why all the gluttony? It was preparing itself for one of the many marvels of nature, the metamorphism from this lowly caterpillar that can travel at best a foot a minute, into the magnificent Monarch butterfly. Weighing in at approximately 2 sheets of paper, this beautiful creature will silently travel close to the ground during it’s 4,000 plus kilometer migration covering 80 to 120 kilometers a day, a treacherous journey that will take 2 months to complete. Locating water and energy sources along the way, through sunshine and rain, wind, heat and cold, it is a “race” against time to keep ahead of the approaching cooler fall months with night temperatures that would surely kill such a small, delicate creature. The final destination is the Sierra Madras mountains of Mexico. 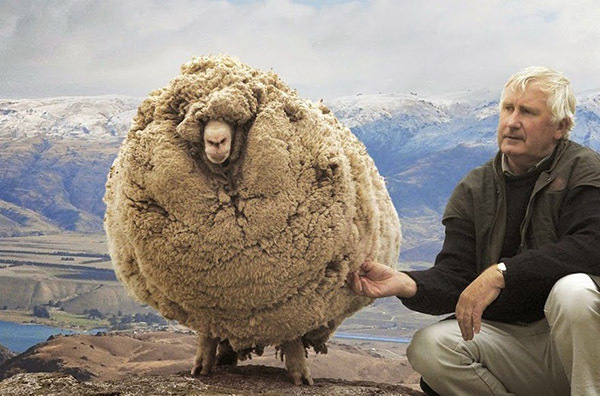 To complete this journey is a huge undertaking for this almost weightless creature. How that butterfly “knows where to go” has baffled scientists throughout the pages of time. Within this tiny butterfly is an internal radar far superior than any roadmap or GPS devised by mankind. As difficult and challenging the migration is for the tiny Monarch, manmade threats are decimating their numbers far more than any endurance migration. According to the website called Learner, the numbers of Monarchs are really plummeting. From 1996, when 1 billion Monarchs completed their endurance event, we are now down to 33 million competing the journey. That is a DROP OF 96% in 17 years. The World Wildlife Fund has listed the Monarch as “near threatened”, meaning it will likely be classified as threatened in the very near future. 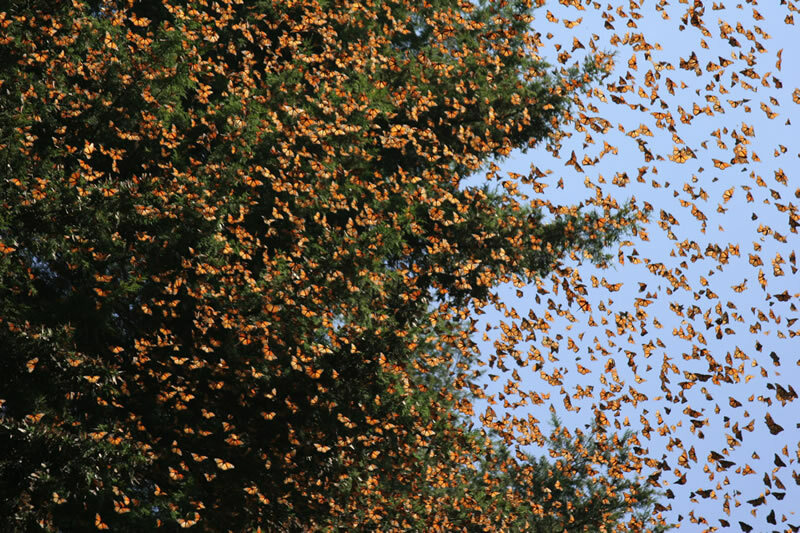 In Mexico, despite their wintering grounds being protected and classified as a “World Biosphere Reserve”, the Monarchs are finding scarce and deteriorating forests, the direct result of illegal logging within these Sierra Madras mountains. 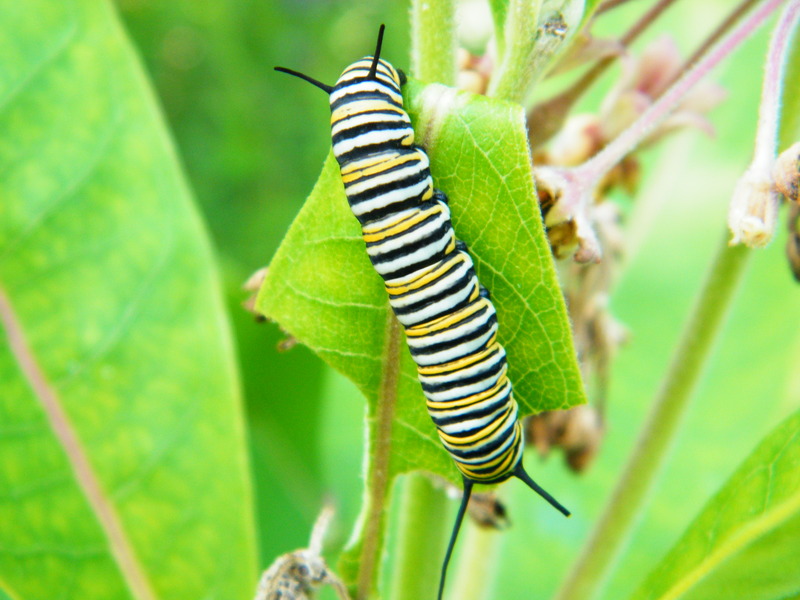 The milkweed plant, which is the only plant the Monarch caterpillar feeds off of, has for decades been listed as a noxious plant. In Ontario, where I live, it has been illegal to plant, and people have always been encouraged to eradicate it. However, great news, the milkweed has just recently been removed from being listed as a noxious weed in Ontario. 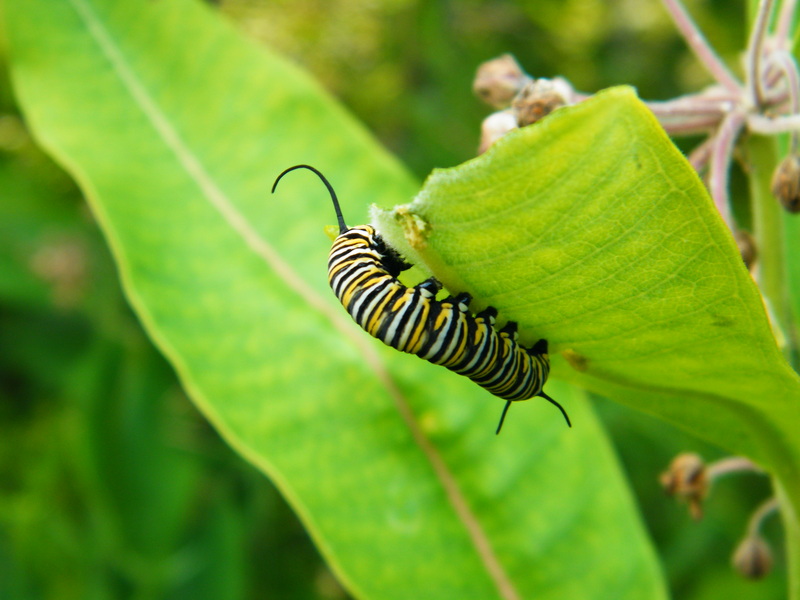 This means gardeners and concerned citizens can now legally plant milkweed to provide habitat for the Monarch butterfly. But if you do plant, please be responsible, that your patch of milkweed is maintained. Lastly, the extreme weather conditions, often attributed to human activity, has been very tough on the delicate Monarch. Hot arid conditions of the past few years have caused eggs to dry out and fail to hatch. I don’t know the outcome of my new little friend. When I left my cousins property after our little getaway, it was still eating like crazy, almost like in a frenzy. So much to do, so little time to do it. Weave a chrysalis, complete it’s metamorphic cycle into a magnificent Monarch. Then feed some more, before embarking on this wild, crazy and gruelling 4,000 plus kilometer endurance event humans call a migration. At the time of this writing, if all is going well, my little butterfly friend will likely be facing the elements somewhere between here and Mexico. Godspeed my special little friend. I am rooting for you and cheering you on your entire journey. Information on the Monarch’s “near threatened” status via World Wildlife Fund. Fact sheet on the Monarch via Defenders. Lastly, an entire website devoted to the Monarch.